Website visitor Joshua H. wrote asking me to scan and post this article on Bob Baron's "PA-6" control line stunt design that appeared in the July 1968 edition of American Aircraft Modeler. Per the airplane's designer, "Cleverly blended design factors - notably engine/prop combination - make this a truly great stunt design." Its 56" wingspan and Super-Tigre .35 BB engine with a 50-oz. 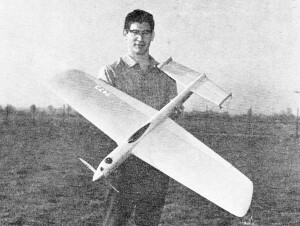 flying weight on 70' lines reportedly results in a near-perfect stunter. Cleverly blended design factors - notably engine/prop combination - make this a truly great stunt design. Rounding an outside loop. Ship has moderate, but very steady pull through all its maneuvers and nearly constant airspeed. Sleek is the word! 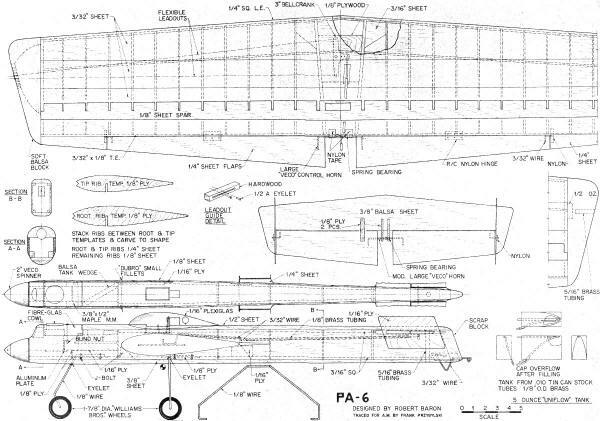 Displayed by its designer, PA-6 shows compactly cowled nose, flowed-in canopy, and smooth surface of sheeted wing. Provision of extra leadout bushings permits fine adjustments. Play line rake and tip weight until ship does not yaw on sharp corners. Engine-tank compartment given two coats fiberglass resin. Tank removable. Super Tigre 35 combat engine permits 15,000 on 10-4. My first thought in designing this plane was to use the maximum allowable line length of 70 ft. and to take advantage of the lower drag of .015 lines for engines of 40 and below displacement. Together with a flying speed below 60 mph, the apparent (angular) speed would be quite slow. 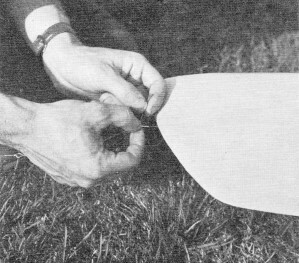 The important trim parameters - leadout sweep, center of gravity, tip weight, and handle width - were to be made easily adjustable on the field to facilitate trimming. 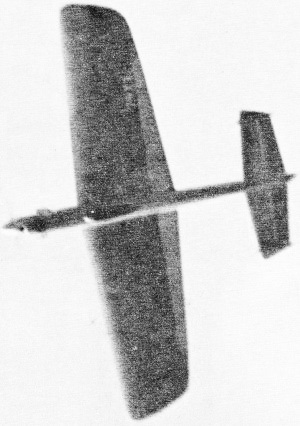 Several features were incorporated to reduce the physical effort of flying to the minimum. 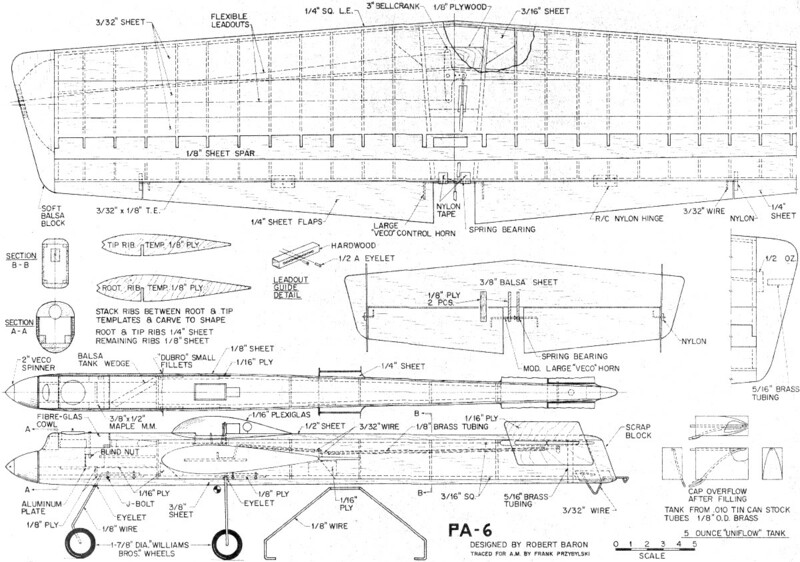 The wing was to be very rigid and to hold its airfoil, which led to an all sheet wing. Ease of maintenance and everyday handling were considered desirable assets. Most important, the prop (10-4) would be of relatively low pitch so as not to stall under loads, and the corresponding high rpm would use most of the available horsepower of our present engines. The resulting 50-oz. ship flies at 54 mph on 70-ft. lines and can be flown through every corner with no tendency to yaw or roll. The pull is moderate but very steady throughout the maneuvers. The flying speed is very nearly constant due to the low-pitch prop not stalling, as does the traditional 10-6. In the wind the low pitch tends to brake the plane. This minimizes the vicious whipping tendency that gives stunt flyers the jitters. A balanced elevator, together with a proper CG, handle, and control setup, reduces the physical effort at the handle, over a conventional arrangement. The sheet wing (13.5 oz.) weighs less than the equivalent capstripped D-tube. A table of weights is provided so the builder can guide himself toward a finished weight of no more than 50 oz. Extruded nylon bearings were used in the hinges to eliminate a frequent trouble spot. A fiberglass cowling and strong front end minimize the usual deterioration of the nose. This plane has a useful life of around 2,000 flights, after which most flyers would be quite tired of it anyway. The tank is readily removable, since when permanently installed, it will no doubt leak due to "Murphy's Law." Aluminum plates in the bearers keep them from crushing with age. The finish was dope, filled and colored, followed by epoxy paint. The epoxy paint has amazing resistance to fuel, and frequently the author takes ten straight flights without bothering to clean the ship. A stooge takes care of the dirty work, as no one would launch a plane that filthy. The choice of wood is vital if the weight is to be kept below 50 oz. Wood of five- to seven-pound density will give the weights listed on the table. Wood ordered directly from Sig with a request for medium-soft will be adequate. The solid flap and empennage are actually lighter than a built up surface, since the finish weighs more over an open surface than a closed one. Glue is the real culprit in the weight department. For curiosity, weigh all the ribs in a stunt wing, then hollow them and check again. It's hardly worth the effort. Building can be greatly speeded by assembling all components (wing, tail, fuselage) as completely as possible separately. The fuselage in particular is built quickly by tack-gluing the blocks and sanding everything to shape without the wing, tail, and tank vents being in the way. After this is done, the blocks and underwing cut-outs are removed and the wing, tail, and gear can be installed leaving relatively little construction to be done. The wing planking is spliced chordwise as shown for a specific reason. The three pieces as shown make it possible to glue the planking with little danger of it popping up after the job is completed. First glue the trailing edge sheet and leading edge stringer with the spar in place, but not glued. Before the glue sets thoroughly, steam the wing as straight as possible. When you are satisfied with the alignment, glue the main spar. Install controls and continue with the center piece. After each sheet is in place smear each rib with glue where it meets the planking to prevent the sheet from separating from the ribs. Do not substitute 1/16 sheet for the 3/32 planking, as it makes the job too critical. Do all sanding with a block to prevent sagging between the ribs. Sand only enough to smooth the seams. The inboard tip sanded and hollowed should weigh .75 ounce and outboard one should weight 1.00 ounce. The fixed tip weight is .50 ounce giving .75 ounce of tip weight to start. The additional .25 to .50 ounce needed is put in the tube as determined by test flights. *1/2 oz. too heavy here means 1 1/2, ounces of nose weight! It is imperative that epoxy glue be used for the engine bearer-doubler, nose gear mount-bearer, wing-fuselage, and main gear-fuselage joints, as well as all horn and hinge mount installations, if the airplane is to last for a reasonable time. The entire engine-tank compartment must be given two coats of fiber-glass resin directly over the bare wood. The finish was two thinned coats of clear on the bare wood, covered with Silkspan, three thinned coats of clear. Then spray on one coat of a mixture of equal Volumes of clear, thinner, talcum powder, and color. This last step should add no more than three ounces when sanded properly, yet will fill all the grain. Finish the ritual with two coats of Hobbypoxy color applied with an airbrush, not a gun. A few words are in order on the engine. The usual plain-bearing stunt engine has neither the power nor strength to run repeatedly at the 15,000 rpms required by the 10-4 prop. 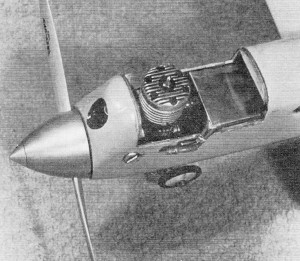 The Super Tigre 35 BB combat mill, model G21/35, with restricter installed, shows no tendency to overheat at the high rpms and low airspeed of this design. In addition, it is operating comfortably below its maximum output on a very mild fuel of 75% methanol and 25% castor oil. No shaft extension is used, as this is only a source of additional vibration. Props must be carefully balanced to prevent excessive wear on both engine and plane. The Tigre starts very quickly when hot, whereas many stunt engines simply will not start until they have cooled. This characteristic makes it possible to fly seven patterns an hour when practicing hard for a meet. This engine is particularly nasty when new, but after a gallon of fuel is run through in five-minute periods on a 10-4 it becomes relatively docile. Proper trimming is essential to the success of any stunter. Our CG is very near the aerodynamic center of the wing which means that inertial and not aerodynamic forces are those principally overcome to initiate a maneuver. My handle is 2.5 inches in line width with the control system shown and the lines are .015 x 70 ft. as measured from center-of-plane to center-of-handle. It is very strongly suggested that the CG and control system be used exactly as shown and that individual preferences in feel be adjusted with handle line width only. First determine if the engine runs exactly the same speed in both directions. If the outsides are faster than the insides, or inverted flight is faster than right side up, the tank is high and the engine must be raised with washers. Next establish the engine setting that gives 55 mph on a Rev-Up 10-4 prop. Steam the wing until line tension is exactly the same right side up as inverted. Do not adjust this tension by bending the flaps. If the ship loses tension on insides but not outsides, then there is more tension inverted and the wing should be steamed accordingly. If tension is lost equally in both directions on loops, try additional tip weight and if that doesn't help, put in additional line sweep. Play with tip weight and line rake until the ship does not yaw on a sharp comer. The actual rake angle agrees very closely with the theoretical calculations of William Netzeband as published in the Sept./Oct. 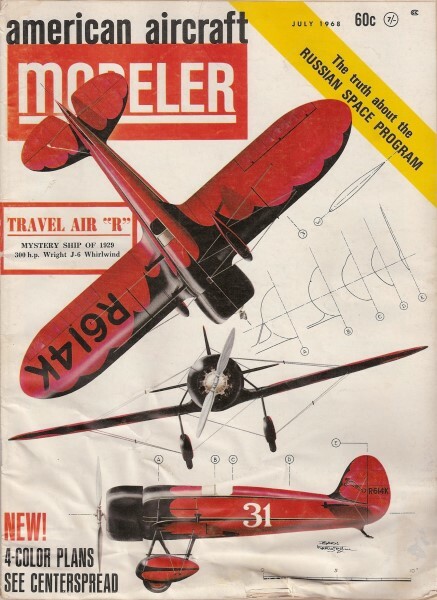 1966 issue of American Aircraft Modeler. I think you will find this ship equal to the competition, and also a pleasure for everyday flying.